Meet redhead princess Merida from Brave movie. Now she is going to mary with the prince she loves. 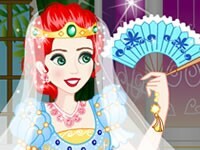 Dress yup princes merida for her wedding.